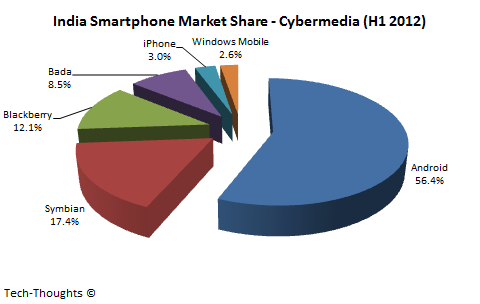 About 5 months ago, I posted an article collating smartphone market share trends from around the world. While I initially intended to use the post as a reference for my research, it became so popular that I decided to make it a quarterly or semi-annual feature. So let's take a look at the country-wise market share trends from various research reports (primarily Gartner, Kantar Worldpanel & Analysys International) published so far in 2012. 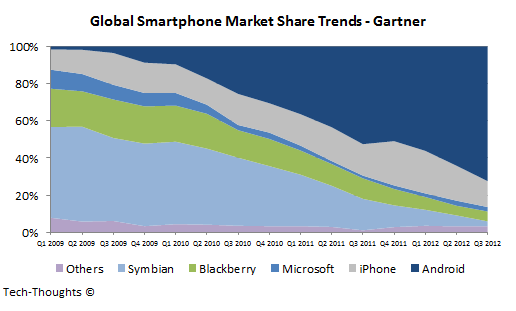 The chart above shows Gartner's global market share figures, by quarter, for the last three years. 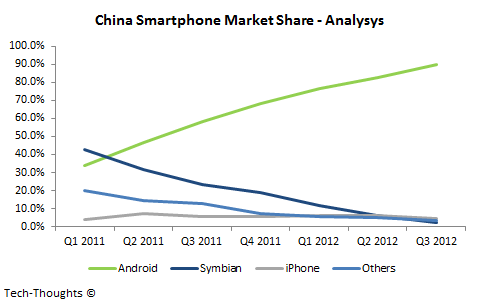 It clearly shows that the Android platform has made most of its gains at the expense of Nokia's Symbian platform. In 2012, Android has taken away market share from the iPhone as well, but this was to be expected before the launch of the iPhone 5. In Q4, the iPhone should pick up some market share before ceding ground again, to Android, in the following quarters. 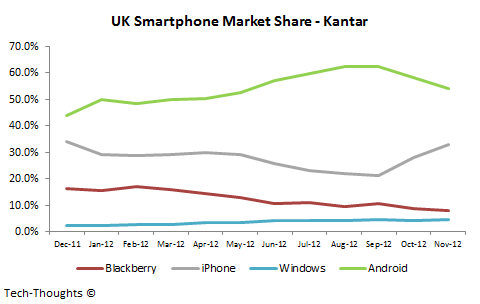 Meanwhile, Microsoft & Nokia seem to have made no impact with their Windows Phone based handsets. Now that we've understood the global trends, let's take a look at the trends in each major region. The iPhone 5 launch helped Apple overtake Android in the US smartphone market. However, this is very likely a temporary effect as iPhone sales should see a sharp drop from Q1, until the next iPhone launch. 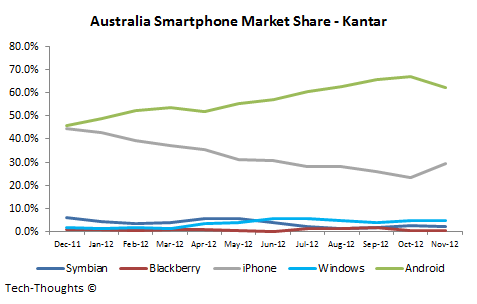 As per Kantar's data, there was a similar trend during the previous iPhone 4S launch as well. The iPhone 4S briefly helped iPhone sales overtake Android from Dec-11 to Feb-12, before Android took the lead. Interestingly, the launch of the Lumia 920 & other WP8 devices seem to have had practically no impact on Windows Phone's "bottom of the barrel" performance. Unsurprisingly, the UK saw the biggest impact of the iPhone 5 among EU5 nations, with the highest two month market share, gain outside the US. 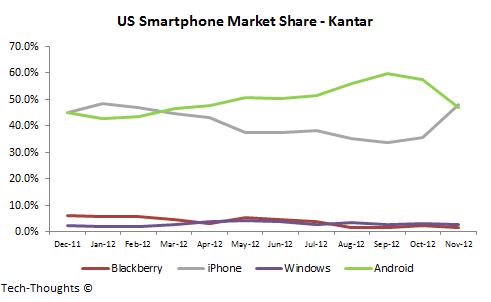 Android is still the dominant platform by far, while Windows Phone is struggling with a roughly flat ~5% market share. In Germany, the iPhone 5 helped Apple gain some market share, but those gains didn't make up for the steep losses it saw earlier this year. The Android platform is still dominant with a ~75% market share, while Windows Phone seems to have lost a lot of ground after the Windows Phone 8 announcement. 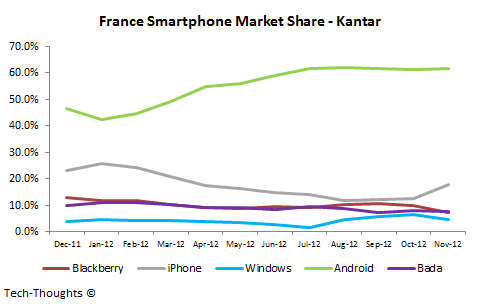 The iPhone 5 helped spur sales in France, but interestingly it seems to have been at the expense of Windows Phone and Blackberry, as Android's market share remained flat at ~60%. France was one of the few countries where Windows Phone had previously shown signs of life, but the sharp market share drop during a high profile product launch (Lumia 920) is worrying. 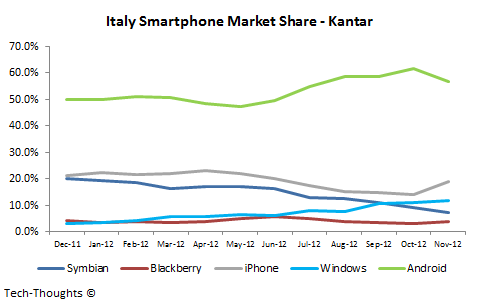 Italy seems to be the lone country where the Windows Phone platform has some hope, with a market share of nearly 12%. The iPhone 5 launch helped Apple make modest market share gains, but the Android platform still leads by a wide margin, with about 57% of the market. 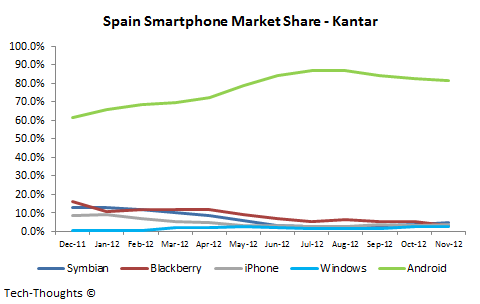 Spain seems to be a single platform market, as Android holds over 80% of the market. All other platforms have been fighting over the scraps with Symbian, Blackberry, iPhone, Windows Phone holding about 2-4% of the market. Recent moves by Spanish carriers to restore subsidies and the iPhone 5 launch seem to have done nothing to help Apple's performance in the country. Kantar's data includes a larger proportion of high-end devices, as compared to Analysys' figures. 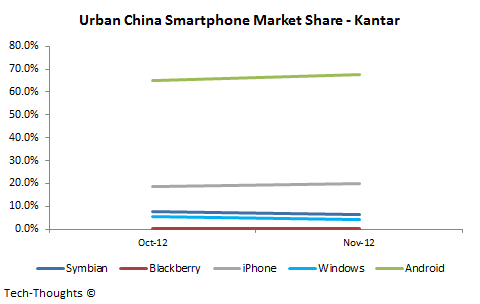 The data shows that the iPhone has a much stronger niche among users in Urban China, but Android still dominates with a ~70% share. Windows Phone still seems to be struggling in China, but Microsoft & Nokia's recent carrier partnership deals should help. It is important to note that because of Google's issues with the Chinese government, the majority of Android devices in China come without Google services (incl. the Play Store). However, since these aren't really "forked" versions of Android, developers should be able to target Chinese consumers by routing distribution through local app stores. The diversified pricing model followed by Android OEMs seems to be paying off in emerging markets, as Android has taken a dominant position. Platforms like Symbian, Blackberry & Bada still hold ~40%, so there is a lot of room for these markets to mature and move to modern platforms. 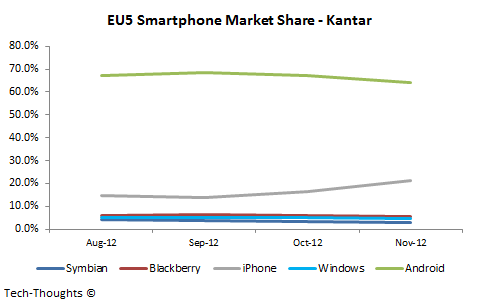 Therefore, these seem like the ideal markets for Windows Phone to gain relevance. 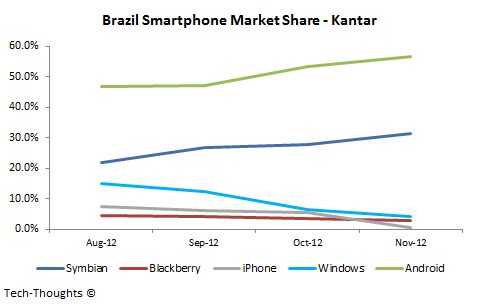 Unfortunately, Windows Phone has seen a sharp decline in Brazil over the last few months because of OEM pricing decisions. Android has seen sharp growth in these regions (held just 42% in India, in Q3 2011), but the iPhone is quite irrelevant in these regions because of the high price tag & consumer independence from carriers. Windows Phone has a small "window" of opportunity here before cheap Firefox devices move in at the lower end of the market. However, given Nokia's decisions so far, I don't expect many rational moves to be made. Insightful- thanks. I'm wondering if you have a view regarding Flurry's activation data. Specifically, in Dec they detected 4m daily activations, 80% of which were phones, or 3.2m/day. Does this sound realistic to you and what fraction do you think were Android? In Sept, ALL Android (incl tabs) were 1.3m/day. Is it realistic to guess that it had risen to 2m/day by Dec.? Flurry's data specifically measured activations on Christmas day, not in Dec. That's not really an average figure but more of a peak because of gifts. Also, even otherwise, I wouldn't consider their data to be particularly reliable because of their methodology. They collect their data via developers using their analytics service (skewed towards iOS). A lot of android devs use Google analytics. Regarding android activation data, they had reached 1 million at the end of June and 1.3 million in September. I think activation figures would be close to 1.5 million now. Thanks for the response. If you carefully review the Flurry post, it actually contrasts Christmas to the the rest of Dec (see first chart, Dec 1-20 vs Dec 25 in the first link I subsequently provided). That said, it's interesting to hear that you view them as skewed toward iOS-- according to them their surveilance code is platform agnostic. So, 1.5 million/day for Android. Do you have a view for iOS? My apologies. You're right about that. I still don't really consider their data all that reliable. They claim 260k apps use their services, but never give an android vs. iOS figure. Apart from this, a lot if android developers have told me that its iOS focused. I don't really have a view for iOS activations. I normally look at apple in terms of quarterly sales. I expect about 45-50 million iPhone sales and about 25 million iPad sales this quarter. You can search my site for the detailed estimates. 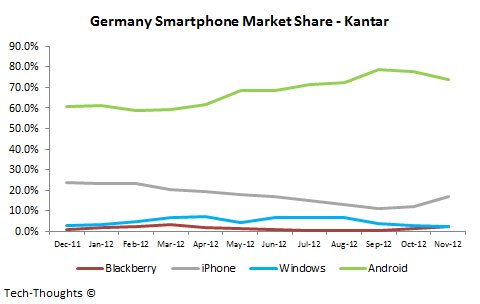 It is already showing that Android is dominating the Smartphone market and Apple can't able o succeed it. I am waiting for the launch of Galaxy S4 and Note 2 than I would like to see the smartphone sell status in USA. 1. Apple's market share for Iphones globally and in India. 2. Apple's revenue collection for Iphones globally and in India. 3. Apple's investment on R&D for Iphones globally and in India. 4. Apple's investment on advertisement for Iphones globally and in India. 1 & 2. In Q4, Apple's global market share was about 22% vs. 4.5%-5% in India. The iPhone's global revenue share is ~40% vs. 15% in India (vast difference in subsidized vs. unsubsidized & emerging markets). Q4 tends to be more of a peak (rather than an average), in terms of both market share & revenue share for Apple (average revenue share is closer to 30% & average market share at 15-17%). 3. Apple consistently spends about 2-3% of revenue on R&D (lower than other firms in the industry). R&D spend is centralized and I don't think much R&D work is done out of India. 4. Apple typically spends 6-7% of its revenue on advertising. I'm not too sure of those figures for India.